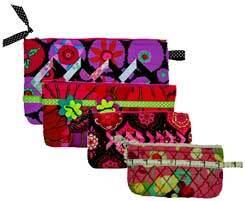 The Eeny, Meeny, Miny & Moe Accessory Bags patterns by Eazy Peazy is a fat quarter friendly pattern for making 4 different sizes of zipper top bags. The zipper instructions are easy to follow and these patterns make great holders for smart phones, e-Readers, make up bags, etc. Soft & Stable interfacing is used to give a professional look to these bags and they are a good learning tool for beginners. Finished sizes are 6" x 10" x 1/2", 4 1/2" x 8" x 1/2", 5" x6 1/2" x 1/2", and 4" x 6" x 1/2".